The socket connection was aborted. This could be caused by an error processing your message or a receive timeout being exceeded by the remote host, or an underlying network resource issue. Local socket timeout was ’01:09:59.9770000′. This error can be deceptive as it doesn’t relate to actual timeout values but instead to the size of the ObjectGraph coming across through WCF. The workaround for this issue is to either break up your packages by sending multiple smaller requests, recommended, or by increasing the size of the MaxItemsInObjectGraph behavior parameter. 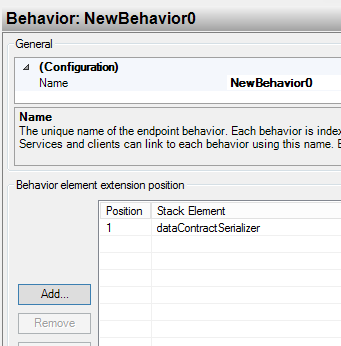 Below are steps for increasing the object graph size for an AIF Inbound port service. 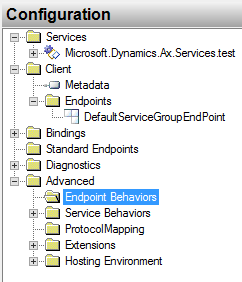 In the Client Endpoint form pane, set BehaviorConfiguration to the configuration you created in steps 7-9.